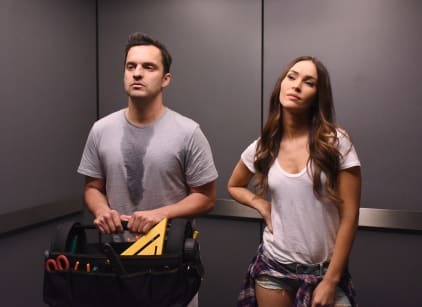 On New Girl Season 5 Episode 9, the friends were uncomfortable in the loft after the air conditioner went out on an incredibly hot day. Nick decided to come up with his own invention involving ice, fans and water, but Reagan one upped him by getting an air conditioner. Nick felt slighted by the entire thing and refused to go into Reagan's room to enjoy the air conditioner. Regan gets worried about Nick when he starts to exhibit symptoms of heat stroke and tries to get him to come into her room, but Nick continued to be stubborn and refuse. The two of them get into a fight and start messing with the electricity in the loft which ends up shorting the fuse and making all the electricity go off. The other friends end up making Nick and Reagan go to the basement to fix their mistake. Nick thinks he is fixing the fuse, but he only ends up shutting the power off in all of the lofts in the building forcing everyone to leave their apartments. Outside Reagan finally gets Nick to admit his feelings for her. While he is rambling on about why it's not a big deal because she is too good for him Reagan goes in for a kiss which immediately shuts Nick up. Meanwhile, Cece is unsure about going into her audition for being a news anchor, but Schmidt is able to ease her nerves. Unfortunately Cece goes to the audition drunk and ends up not getting the job. Don't feel bad if you missed out! You can watch New Girl online anytime via TV Fanatic. Science aside man you're working those jeans. Permalink: Science aside man you're working those jeans. I look like a 70's divorce attorney. Permalink: I look like a 70's divorce attorney.